MARGAREE HARBOUR, N.S. — It was the dark side of twilight when I spotted it, a ways down the beach. The silhouette had a hump almost like a raccoon, only its legs were longer and it didn’t waddle. It slinked. Our shallow beach on the Gulf side of Cape Breton is sheltered on three sides by deep cliffs. The day before we got here there was a bear sighting up at the Dumpster, but the creature on the beach seemed to small to be bear. Too big for a fox, though. Coyote, then. It slithered down to the water, across to the cliffs, criss-crossed back closer to us. He paused, seemed to be sizing us up. We knew he wasn’t comfortable with us, either. We were pretty loud and scary in front of our beach fire. But we were on his land and he’s got big teeth and an instinct to survive. Our survival instincts are dull enough that not one of us thought to bring a flashlight. 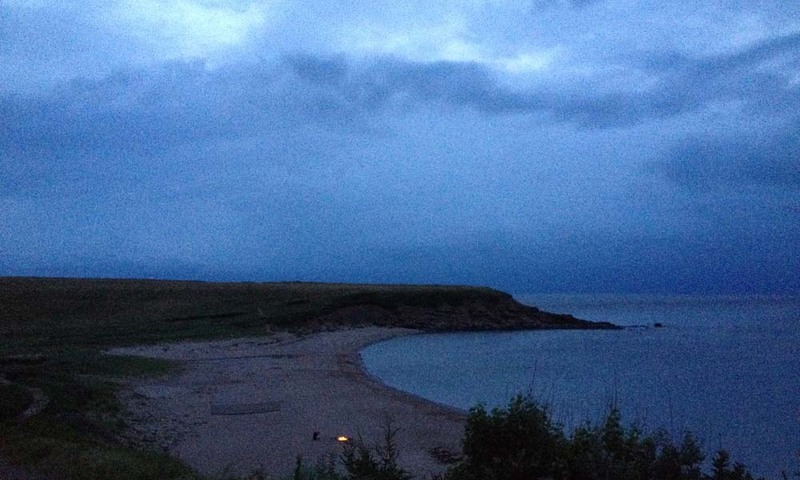 So there we were, full of hot dogs and marshmallows on a deserted beach under cloud cover as the last vestiges of sunlight spilled over the edge of the earth. There was a wild animal right there and no one had a personal light source. Brave Trevor volunteered for the black, half-kilometre hike back to the cabin for gear. We sent the food with him. The creature had disappeared into the tall grass at the side of the cliff. It was full dark and we felt very alone. It seemed Trev had been gone for a very long time. My watchdog was firmly asleep in my lap. There were no stars; we could no longer see shadows. There was no way to track our silent creature friend. And where the hell was Trevor, anyway? Then! On the horizon! Two spinning, glowing orbs appeared on the horizon. Blue and red, then gold, then purple, the unmistakable pattern of Trevor’s poi. Our boy was returned, and with him flashlights for everyone. We laughed, and relaxed and contemplated what to do with our embers while he spun poi in front of the ocean for us. If the evening had ended there, all would have been right with the world. But it was about to get better. There was a bit of a commotion at the top of the cliff as a car was relieved of its passengers. Their flashlights bobbed down the path, paused a moment at the top of the wooden stairs. As they became human forms, we welcomed them and offered them our coals. They set up their chairs on the cliff side of the embers and added their wood, building the fire up. There were three women in their party, two with sparkling silver hair, and two men—the companion of one of the silver-haired ladies, and the son of another. They brought their own firewood, their own wine and their own laughing sense of adventure. They had clapped when they’d seen Trevor spinning poi and soon we realized why, when young Ian put on music and began to spin poi himself. The two played side by side for a while, till Trev moved away to watch instead, and to learn a few more moves. This new young man had spent some time learning how to craft a show and we sat mostly quietly while he danced and spun to his trancy music. “I’m okay,” she called, not from the place we’d expected her to turn up. Then she was back in the circle of light, arms extended, joined by another lady. Their poi artist never missed a beat. The gods were among us. The magic was all around us. But the fire hadn’t been fed in some time and was reduced to hot, glowing coals. 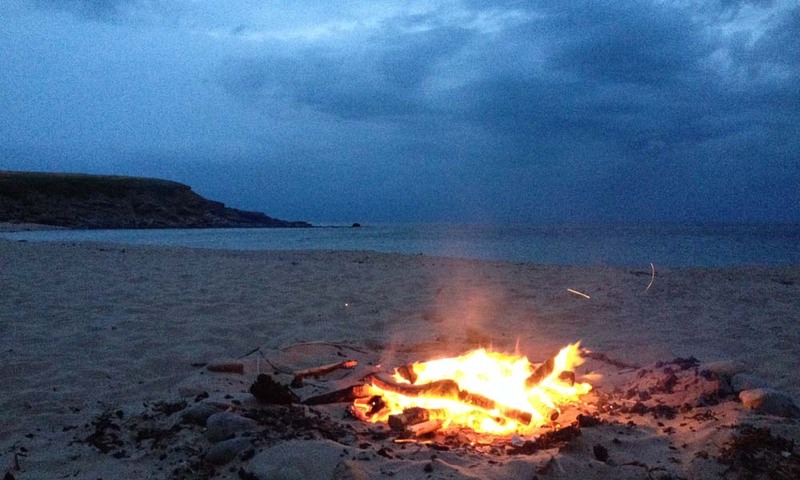 The brutal Cape Breton winds were chilly without the fire to counteract them. It was time to call it a night. And a night it certainly was.